January 16 1909 -- It all started as a minor case in which some employees of the city's library were accused of padding their time records. Then library director of research Dr. C.J.K. Jones turned the proceedings into a circus, producing copious detective-like notes he purports to have kept on the comings, goings, and misdeeds of the library's female employees. He in turn is accused of keeping a bottle of whisky hidden in the library's safe, from which he dispenses tipples to any female employee who feels faint or dyspeptic, and thus making the safe room some sort of den of debauchery. Then another employee claims to have walked in on two of the women librarians engaged in behavior so shocking that his sense of decorum did not allow him to describe its nature on the witness stand. Herriman, sadly, seems oblivious to the cartoon possibilities of all this. What sort of yellow journalist is he, anyway? Herriman refers to Big Chief Lummis in this cartoon, who must be Charles Fletcher Lummis, who at one time was editor of the Los Angeles Times. In 1905 he was a L A City Library staffer and an expert on American Indian Lore. He built a house called El Arisal which is an historic landmark today. Oh my. Can't imagine this card was a big seller. I mean, the wordplay is actually inventive and all, but still ... Even the cow can't believe that this card was published. 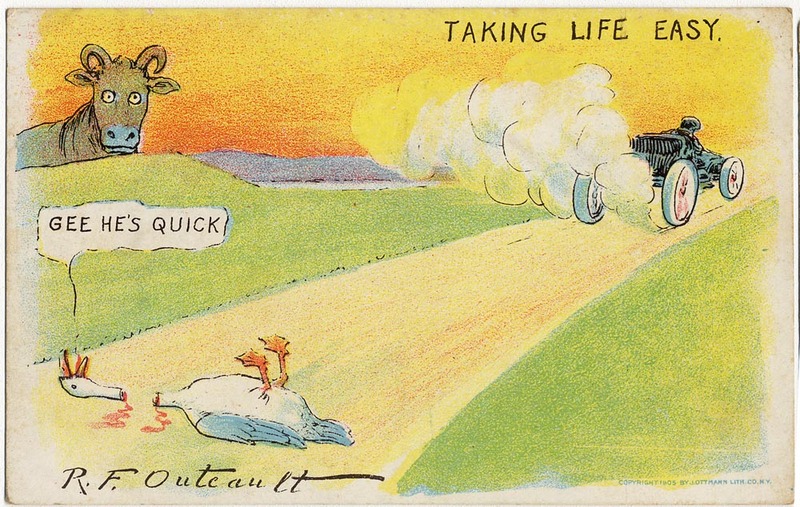 Anyhow, this is another Outcault card from J. Ottmann copyrighted 1905. I checked out your book (American Newspaper Comics - An Encyclopedia Reference) yesterday from my local library. I wanted to give you an update in regards to the end date you gave Virgil Partch's "Big George!". You have it listed as 1989, when it actually ended on June 8th, 1991 (as sourced from the Elyria Chronicle Telegram). I'm not sure when the Sunday strip ended, as I can't find any examples as recent as 1983. OK Allan. I'll try and do that first thing (or second thing) tomorrow. Freshly purchased by Hearst, Winsor McCay's 1912 was a hugely productive year. He kept up his fabulous Sunday strip Little Nemo (now titled In The Land of Wonderful Dreams), produced and toured with his second animated film How a Mosquito Operates, and also contributed a substantial number of weekday strips to Hearst's New York American. 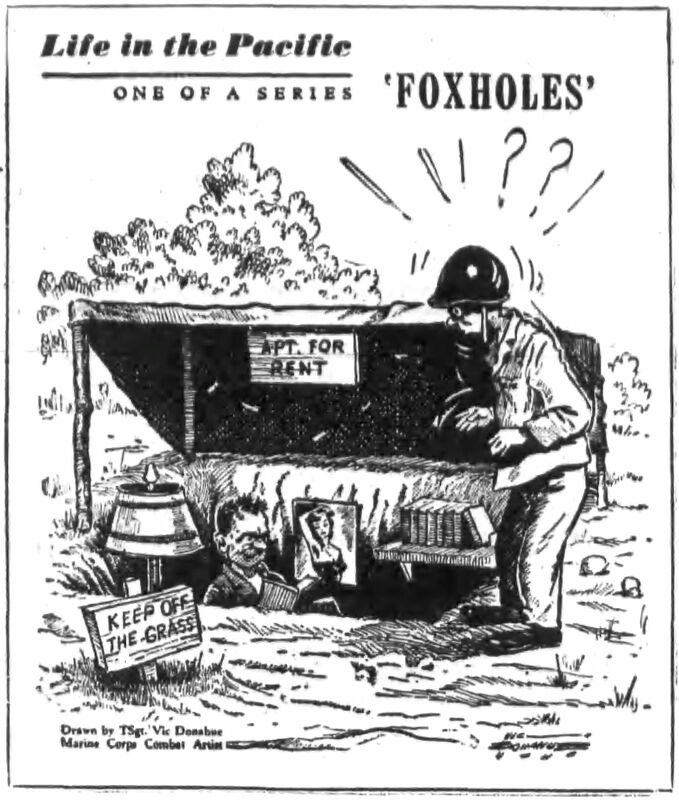 Among those strips was The Man from Montclair, which appeared occasionally from May 10 to December 21 1912. The gag is that this fellow who lives in Montclair New Jersey, who is apparently quite the pillar of the community out there, comes into the city and gets involved in shenanigans, usually related to chasing girls, that he sure doesn't want the home folks to hear about. As Emerson said, "commit a crime and the world is made of glass." It seems like everybody he meets when he's up to no good is from Montclair. Winsor McCay doesn't go for graphic fireworks in the strip, but the perceptive take on what people do when they're away from home is a sharp psychological study. 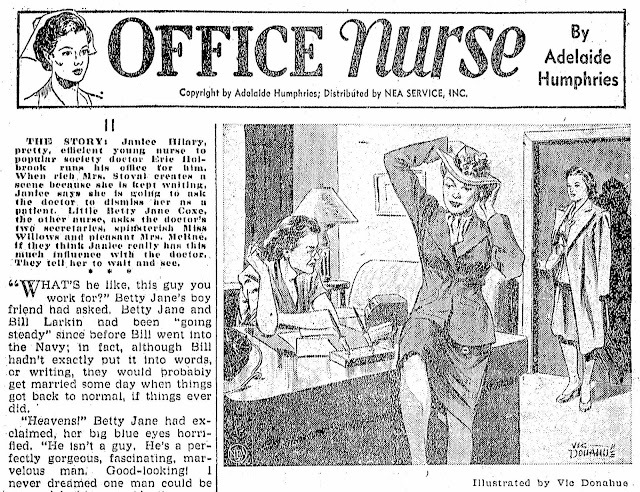 The strip appeared in other papers in the Hearst chain. In the Chicago Examiner, it had a change of venue to become "The Man From Evanston". maybe this happened elsewhere. 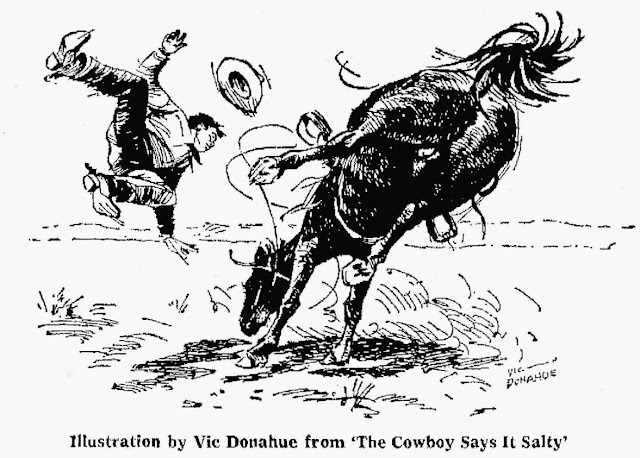 When Art Bowen produced material for the past-its-prime McClure Syndicate Sunday comics section in late 1912 to early 1913, quite frankly he produced very little worth remembering. Here is Always Take Mother's Advice, a strip about a kid who gets in trouble in spite of trying to be good. It's a strip that takes up a half page's worth of space, and nobody can take that away from it. The strip ran from July 21 to December 15 1912. 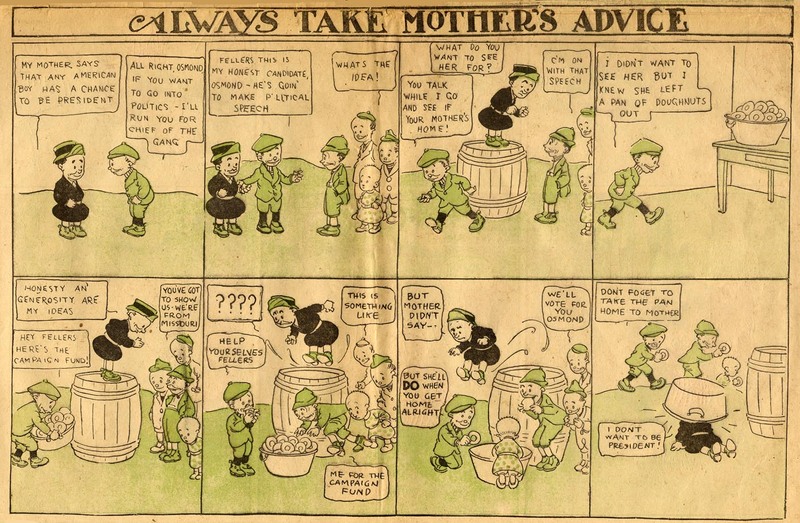 An additional strip ran late in October 1913, but I'm assuming that was a leftover or a rerun. Wings of Tomorrow - The Story of Aviation is a closed-end NEA strip that really stretches the bounds of the definition of comic strip. Vast seas of type hanging at the bottom of each 'strip', and pictures that merely served to illustrate the blah-blah-blah should have led me to the conclusion that it didn't merit listing in my book. However, I was impressed enough at the quality of the illustrations that somehow I managed to make a case to myself for its inclusion. What can I say? If it offend thee, get thine magic marker and strike it out of your copy. After the end of World War II, which saw huge strides in aircraft technology, people were asking, "So what next?" Well, here was aviaton expert Charles Tracy to tell those inquisitive folks, ably assisted on the visual end by Vic Donahue. The series ran two weeks, from October 28 to November 9 1946 (your mileage, er, newspaper, may vary as is typical with these NEA offerings). After a dull recap of aviation history that took up the first week, Tracy cut loose with the predictions. As is to be expected, he got some right, and others very wrong. He predicted burgeoning passenger air traffic, moon landings and even the automated parcel delivery that is just now starting to look feasible*. 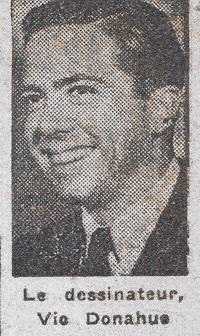 On the other hand, he envisioned an "air-car" in every garage, and he was pretty darn sure that most airplanes would soon be propelled by either rockets or atomic power. Have to hit the buzzer on those, fella. * can anyone tell me just how the heck drones are supposed to safely leave a package at their destination? Are they going to drop it like a bomb from the sky? Or are they going to go the Yule route and drop the packages down the chimney? Or will they gingerly deposit it in the yard where some neighborhood tough will immediately recognize the opportuinity to abscond with some Amazonian treasure? You can't tell me they're going to hover at the front door, press the door bell and wait patiently for the hausfrau to appear and sign for the package. I forgot to say, Central Press and KFS offered some of these news topic stories too, and that's where these Scott and Buescher strips come from..